Every year, large amounts of marijuana, methamphetamine and heroin enter the U.S. close to Arizona’s border. Through the High Intensity Drug Trafficking Areas and Deferred Prosecution programs, local agencies are committed to combatting the state’s drug epidemic. In the past few years, the rate of drug overdoses in Arizona has exceeded the national average. Illicit drugs crossing the border from Mexico into southern Arizona continues to be a difficult challenge for local law enforcement agencies. Arizona experienced a 16 percent increase in pharmaceutical opioid and benzodiazepine-related deaths between 2013 to 2014. In that same time period, heroin-caused deaths jumped 44 percent. Increasing amounts of marijuana, methamphetamine and heroin enter the U.S. close to Arizona’s border. Although large quantities of marijuana have been seized while trying to cross into the state, trafficking remains a serious issue. Heroin is another problematic drug in Arizona’s southern regions. As prescription medication regulations intensify across the nation, the demand for heroin is reaching record levels every year. With the drug entering the state frequently, it’s easy for users to get access. Now Arizona government agencies are trying to get a hold on cartels trafficking low-cost heroin across the border. Other organizations have also stepped up to help raise awareness about the dangers of heroin to keep communities safe. In Arizona, the possession, sale, manufacturing and trafficking of drugs is illegal. Criminal charges are serious and sentencing is harsh. Penalties depend on the type of substance as well as the amount involved. Manufacturing and trafficking entail a more severe punishment than possessing a drug; however, both are serious crimes. Each classification has different levels of charges and sentencing. If you or someone you love is fighting an addiction, it’s time to take back control of your life. Treatment will provide you with the tools necessary for long-term sobriety. Enter your number to receive a call from a treatment expert. If you or someone you love is fighting an addiction, it’s time to take back control of your life. Treatment will provide you with the tools necessary for long-term sobriety. Call us today to find a treatment center near you. Medical marijuana is legal in Arizona; however, any recreational use of marijuana is illegal throughout the state. Home cultivation is allowed, but you must reside further than 25 miles from a state-licensed dispensary facility. Additionally, you are only legally allowed to have up to 12 marijuana plants that are in an enclosed and locked facility. For individuals located near a dispensary, there is a possession limit of two and one-half ounces of usable marijuana. The recreational use of marijuana is illegal in Arizona and you can be charged for possession in varying amounts. Under Arizona’s Prescription Drug Monitoring Program (PDMP), medications prescribed by doctors or dispensed by pharmacies are tracked. Medical professionals authorized to distribute substances are required by law to submit prescription information to the State Board of Pharmacy on a weekly basis. Several counties in Arizona are part of the High Intensity Drug Trafficking Areas (HIDTA) program. Many of these communities are located near the border of Mexico, which is where the majority of drug trafficking takes place. Law enforcement agencies and elected officials provide counties with equipment, technology and other various resources in their fight against drug trafficking. To date, the program has helped seize millions of dollars’ worth of marijuana, cocaine, methamphetamine and heroin. 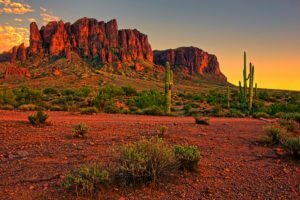 Residents of Arizona may qualify for a deferred prosecution if they are charged with drug possession. While it’s only available under certain circumstances, such as a first offense, it helps people recover with a reduced jail sentence. During a deferred prosecution, the state holds off on its prosecution while the individual participates in a probationary term. If you complete the probation requirements successfully, your charges will be dropped. However, failure to fulfill the program’s requirements may result in prosecution for your original charges. Arizona offers a wide range of comprehensive recovery programs that often involve inpatient or outpatient rehab, addiction counseling, medication-assisted therapy and support groups. These programs together provide the greatest potential for long-term sobriety. Sometimes though, the best treatment available may not be in-state. Out-of-state treatment options have been expanding in recent years and offer many benefits. Seeking treatment in another state can help you avoid distractions and focus on bettering your life. You may even find that out-of-state facilities offer what you’re looking for in a treatment program and are tailored to your needs. It’s an opportunity to get a fresh start along your road to recovery. The Arizona Department of Corrections offers substance abuse treatment to its offenders. Each person is ranked according to need, time left to serve, and risk of relapse into one of four categories: intensive treatment, moderate treatment, educational or no need. An intensive treatment program lasts for approximately 12 months, whereas moderate treatment takes roughly six months. Treatment is offered at different jails and prisons statewide and is managed by licensed substance abuse counselors. In addition, some facilities offer an opportunity to participate in self-help and support groups. Volunteers set up support groups such as Alcoholics Anonymous, Narcotics Anonymous and SMART Recovery. Depending on the facility and volunteers’ schedules, support groups may be offered on a weekly basis. The first step in recovering from drug or alcohol abuse is seeking treatment. Contact us today to learn more about the treatment options available for you.